Home EG Newswire Technology LightPath (NASDAQ: LPTH) Technologies: Analysts are mixed. Should you accumulate here? LightPath (NASDAQ: LPTH) Technologies: Analysts are mixed. Should you accumulate here? Miami, FL – November 23, 2018 (EmergingGrowth.com NewsWire) — EmergingGrowth.com, a leading independent small cap media portal with an extensive history of providing unparalleled content for the Emerging Growth markets and companies, reports on LightPath Technologies (NASDAQ: LPTH). It has been a long year for LightPath Technologies Inc. (NASDAQ: LPTH)shareholders. Unlike the broader NASDAQ PHLX Semiconductor Index (NASDAQ: SOX) which has only dipped by 3.3 percent, shares of the company have been hammered on a YTD basis, as the market appears unconvinced of its future prospects. 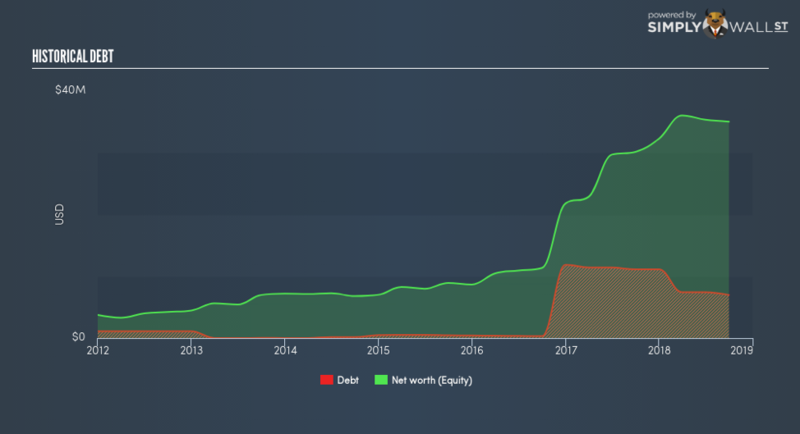 At the current price of $1.75 per share, the question of whether LightPath presents a compelling investment case as a result of the recent share price weakness is explored..
LightPath Technologies is a semiconductor materials company. It manufactures optical components including precision molded glass aspheric optics, infrared aspheric lenses, glass lenses and other optical materials used to produce products that manipulate light. These products are utilized in highly sensitive areas such as defense, medical devices, laser aided industrial tools, automotive safety applications, barcode scanners, optical data storage, hybrid fiber coax data communication, telecommunications, machine vision and sensors, among others. LVPMO(“low volume precision molded optics”) – consisting of precision molded optics with a sales price greater than $10 per lens that are usually sold in smaller lot quantities. HVPMO(“high volume precision molded optics”) – consisting of precision molded optics with a sales price of less than $10 per lens that are usually sold in larger lot quantities. Specialty products– comprised of value added products such as optical subsystems, assemblies, GRADIUM lenses, and isolators. Infrared products– comprised of both molded lens and assemblies. These can be used for gas sensing devices, spectrometers, night vision systems and automotive driver systems. Currently, industrial market that uses thermal imaging cameras are the primary customers. NRE(non-recurring engineering) – consisting of products the company develops according to product development agreements it enters into with customers. Typically, customers approach LightPath and request that it develop new products or applications for existing products to fit their particular needs or specifications. LightPath’s revenue for the fourth quarter of 2018 was $8.1 million, down 10 percent from $9 million in the same period of last year. FY2018 revenue however, increased 15 percent to about $32.5 million compared to the prior year on the backdrop of surging infrared optics sales. Over the past five years, LightPath has delivered over 20 percent year on year earnings growth. However, earnings for FY2018 dropped to $0.04 from $0.36 last year but a huge chunk of the decline could be attributed to a one off tax benefit in the prior year. Gross margins averaged 30 percent for the fourth quarter of fiscal 2018 compared to 48 percent for the prior year period with majority of the gross margin decline being due to lower PMO volumes as well as an unfavorable impact by currency fluctuations on the rising cost of germanium. In terms of bookings, LightPath took orders during the fourth quarter of fiscal 2018 valued at $9.9 million, an increase of 43 percent compared to $6.9 million in the prior year period. Looking at backlog, the product category of PMO represented 32 percent of backlog and IR was 62 percent of backlog. Overall, 12-month backlog increased 38 percent to $12.8 million as compared to $9.3 million in the year ago period which was fairly consistent with prior years. The year-over-year increase reflects strong bookings for a significant portion of the company’s product lines and the bookings of a large infrared annual contract during the second quarter. Bookings substantially increased despite the telecommunications sector into which LightPath sells its higher margin PMO products, reaching what appears to be the trough of its downward cycle. This adversely affected the unit volume by approximately 35 percent. Lastly, with the completion of the ISP Optics acquisition in fiscal 2017, LightPath gained the cornerstone of what it believes will be its primary long-term growth engine (infrared optics). Since acquiring ISP, management revealed that it has been able to take a business that had $12 million in revenues in fiscal year 2015 and grew it to just under $15 million in revenues for fiscal 2018. 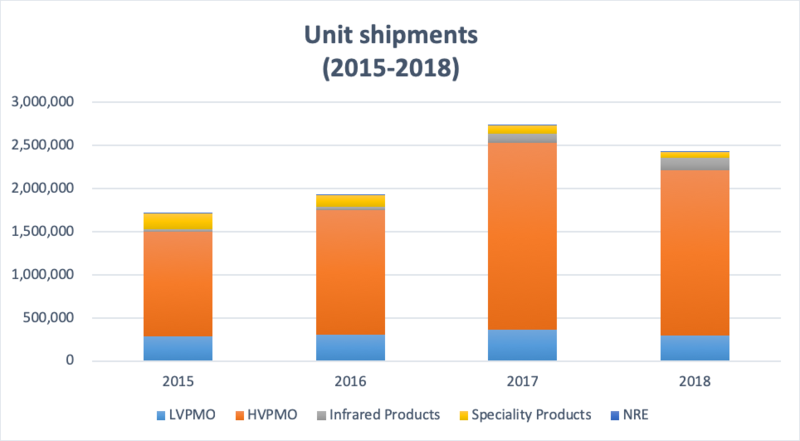 Sales of both LVPMOs and HVPMOs have posted strong gains since 2015 in what appears to signal a multi-year growth cycle in the optics market. The company explains that this growth will continue being driven by four major trends which are: data centers, digital video distribution, wireless broadband and machine-to-machine interface. As mentioned earlier however, the main growth driver for the company going forward will be infrared products. During fiscal 2018, revenues from sales of infrared products increased 73 percent, as compared to fiscal 2017. Unit shipment volume increased by 43 percent and average selling prices increased 20 percent for fiscal 2018, as compared to fiscal 2017 clearly illustrating the surging demand. According to a new market research report “Infrared Imaging Market by Technology – Global Forecast to 2023”, the infrared imaging market is expected to grow from $5.16 Billion in 2018 to $7.30 Billion by 2023, at a CAGR of 7.18 percent between 2018 and 2023. The growth of this market can be attributed to the high demand for infrared imaging products from the military and defense sector, primarily for security and surveillance application. A specific advantage over Umicore (OTC: UMICY), a foreign company, is that the infrared market is highly dependent on the United States defense industry, which prefers to purchase from United States based companies such as LightPath. We therefore believe that LightPath couldn’t be better positioned to grab more share of this rapidly growing market. The market for optical components is generally highly competitive and fragmented. Aspheric lens system manufacturers include Panasonic Corporation (OTC: PCRFY), Alps Electric Co., Ltd., Hoya Corporation (OTC: HOCPY), as well as newer competitors from China and Taiwan, such as E-Pin Optical Industry and Kinik Company. The main advantages of aspheric lenses over regular lenses is their optimal performance as well as their ability to simplify and shrink optical systems by replacing several conventional lenses. However, these lenses are costly and difficult to machine so molding is the most consistent and economical way to produce the aspheres. What gives LightPath an edge over peers’ glass molding technology enables it to produce both low and high volumes of aspheric optics at an affordable price. From the company’s conservative estimates, it believes that there is an approximately $1.7 billion market for its current products and capabilities. Aspheric lenses compete with lens systems comprised of multiple conventional lenses while machined aspheric lenses compete with molded glass aspheric lenses, which are part of the company’s HVPMO product group. During the most recent quarter, LightPath was able to reduce its total debt by 35 percent to $7.4 million, while maintaining a healthy cash position of $6.5 million as at the end of the period. Total assets stood at $47.1 million compared to total liabilities of $11.7 million indicating the resiliency of the company’s financial position and ability to meet short term obligations. On a comparable basis, LightPath’s shares appear overpriced looking at the P/E alone which is likely the market’s reasoning for driving down its share price. 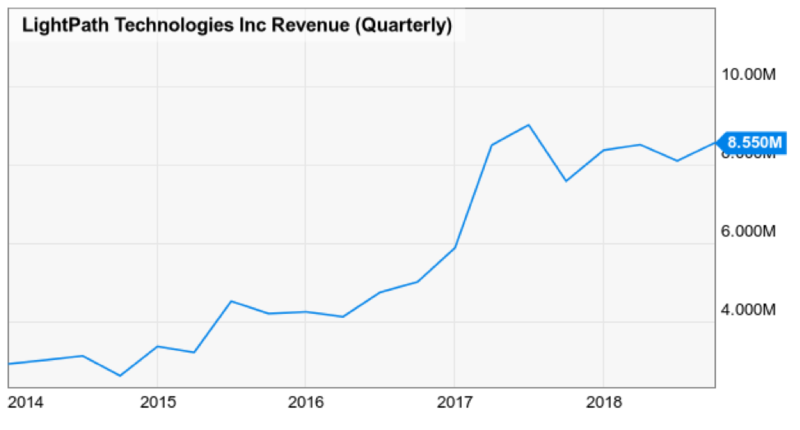 In spite of this, investors should be aware that there are plenty of opportunities for the company to grow earnings over the next couple of quarters thanks not only to infrared products and PMOs which have relatively higher margins, but also the strong backlog mentioned earlier. Analysts at Roth Capital set a $3.00 target price on shares of LightPath Technologies, implying at least 60 percent upside potential and gave the company a “buy” rating in a report back in August while Dougherty & Co lowered shares of LightPath Technologies from a “buy” rating to a “neutral” rating in a report on September 14th. Dougherty’s Catharine Trebnick however, pointed out the silver lining of strong infrared product demand. One of the biggest concerns for investors here is likely to be customer concentration risk. In fiscal 2018, LightPath had sales to three customers that comprised an aggregate of almost 28 percent of its annual revenue, with one customer at 16 percent of sales. Furthermore, the company’s need for a clear strategy to elevate gross margins has compounded in fiscal 2018 as the primary raw material that makes up approximately 40 percent of the cost of an infrared lens increased by nearly 28 percent this year. Finally, a key area to closely watch will be how LightPath deals with capacity constraints and telecom weakness which significantly contributed to EBITDA and sales miss targets. For now, the best course of action for investors to take would be to hold on to their positions in LightPath and only increase their sizing incrementally instead of going all in.